The average American eats about 12 pounds of carrots each year, according to statistics from the U.S. Department of Agriculture. Of those, more than 8 pounds are fresh, raw carrots. 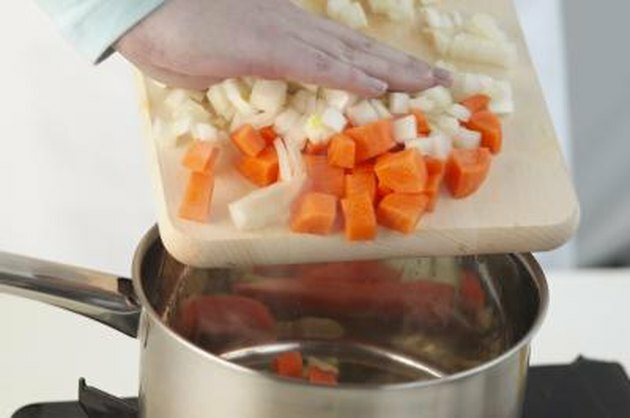 When deciding whether to eat your carrots raw, or boil them in a pot on your stove, understanding the nutritional differences for the two preparation methods can help you balance your nutrient and calorie intake for the day. A cup of chopped, raw carrots contains 52 calories, and .31 grams of fat, while a cup of carrots boiled in water with no added salt gives you 55 calories and .28 grams of fat. Eating a cup of raw or cooked carrots gives you less than 3 percent of your calories if you follow a 2,000-calorie diet. The raw carrot serving also has 1.2 grams of protein, 12.3 grams of carbohydrates and 3.6 grams of dietary fiber. Boiled carrots contain about the same amount of protein, slightly more carbohydrates and 4.7 grams of fiber. Boiled vegetables lose some nutrients, but retain many. This is the case with boiled versus raw carrots. A cup of boiled carrots has two fewer grams of vitamin C than a cup of raw carrots, and two less micrograms of folate. Boiled and raw carrots have about the same concentrations of the B vitamins, although a cup of cooked carrots has 1 milligram of niacin, and the raw carrots have 1.3 milligrams. Boiled and raw carrots both contain substantial amounts of vitamin A. One cup of raw carrots has 1,069 micrograms, and cooked carrots have 1,329 micrograms. The average adult needs between 700 to 900 micrograms each day. Boiled carrots have 1,072 micrograms of lutein, and raw carrots have just 328 micrograms. Lutein aids in your eye and skin health, according to the Linus Pauling Institute. The mineral content in boiled versus raw carrots varies depending on the mineral. The calcium increases from 42 milligrams in a cup of raw carrots to 47 milligrams after boiling. Iron, magnesium and phosphorus also increase slightly when you boil the carrots. The potassium content drops in boiled carrots to 367 milligrams, as compared to raw carrots, which have 410 milligrams per cup. Both types of carrots have about 90 milligrams of sodium per serving, which is 6 percent of the recommended daily intake. The similarities in the nutrient content between boiled and raw carrots make it possible for you to always boil your carrots and not miss the nutritional benefits of eating them raw. If you find raw carrots difficult to digest, boiled carrots might be easier on your intestinal system. Use boiled carrots in stews, as a side dish or puree them with other vegetables for a vegetable drink. Avoid adding salt to the water, as boiled carrots cooked in salt water have 471 milligrams of sodium, or 381 milligrams more than carrots boiled in plain water, according to the USDA Nutrient Data Laboratory.